I regret the exposure on this one, but not the moment. I don't know, Leslie. You may regret the exposure, but I think it adds something to the moment, something magical. I wonder what Atticus was thinking. Atticus was listening so intently. I too wonder what he was thinking. Great shot. I was there. Atticus was thinking, "If only I was alone with this kid." Kiran is wearing his "engineer's hat," which I insist on when he plays with my trains. 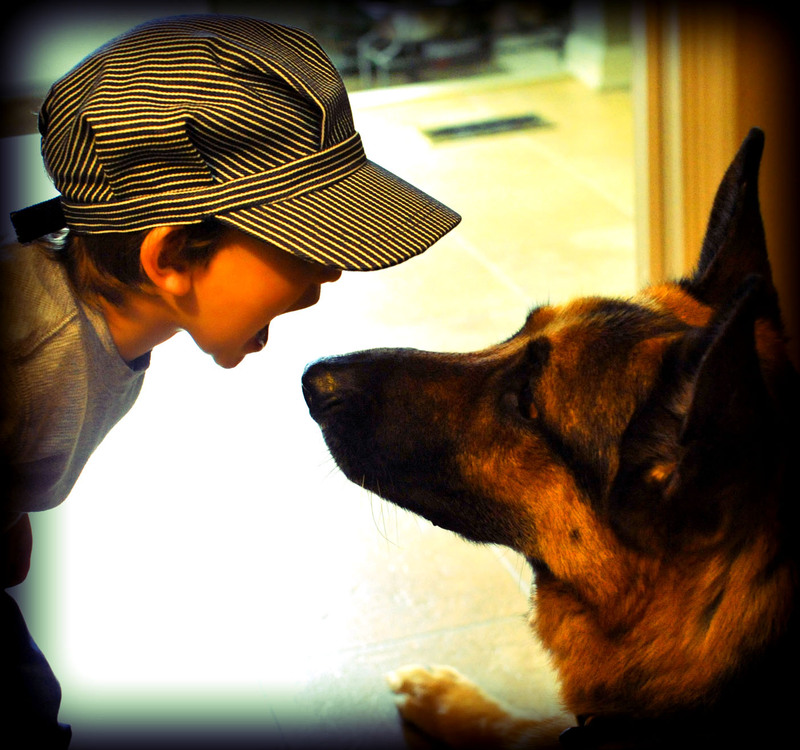 No one can place too high a value on the relationship between a boy and a dog. No matter what the child is saying, the dog is interested. And to the child, everything about the dog is reasuring, comforting, and pleasurable. This relationship can never be replicated with fish, who do not care about little boys, nor parrots, who may have a checkered past from the docks. Obviously, Atticus is a good listener. Laugh. Sting would lay forward, Caiden would sit crossed legged in front of Sting, between Sting's front paws. Sting would growl, Caiden would growl and laugh. Sting would hang his tongue out and pant like he was laughing too! Then they would do it again. This could go on for a good half an hour if I let it! My pup is going on 12 now and drastically slowing down... Caiden must be around 9? 10? Lost track of his family years ago, but I'll never forget that game! Actually, the exposure seems perfect to me!